Well this is the last of the Festivus Book Pimping, and I didn’t get to anywhere near as many books and authors as I’d have liked, but that just means I’ll have to continue the book pimping sans Festivus. So, to finish this series, I’ll be pimping myself… well my comic, which means I’m also pimping GN Braun and Monty Borror. Pimpity-pimp-pimp-pimp! 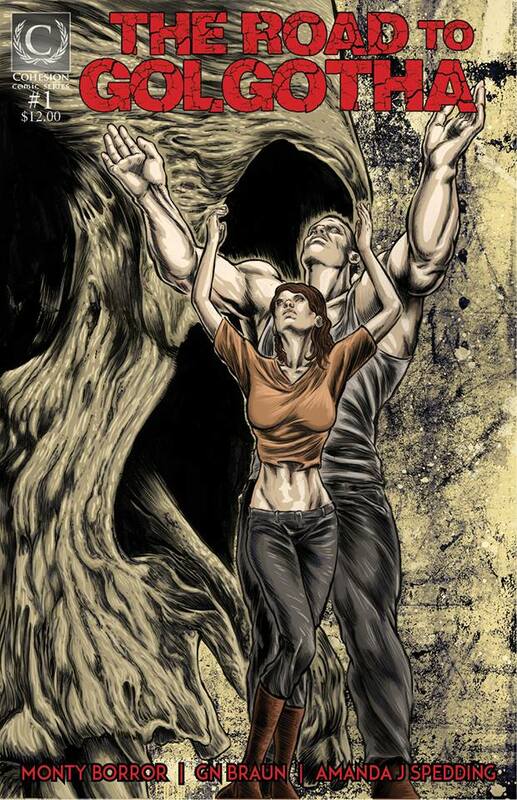 In June of this year, The Road to Golgotha was launched at Melbourne ComicCon through Cohesion Comics – the inaugural comic for the press’ new imprint. Here you get two horror stories – that’s right TWO, within the one beautifully-designed, 78-page book. The first, His Own Personal Golgotha, is penned by GN Braun; the second is mine – The Road. And it’s all magically brought to life on the pages by the uber-talented artist, Monty Borror – the man is a genius at interpretation; his art, magnificent. I flew down to Melbourne for the launch with my daughter, and we had an absolute blast. Meeting with old friends and making many others, we were surrounded by the Geekdom that makes us all happy. To top it off, it was the launch of the comic. Something GN, Monty and I had put our hearts and souls into. 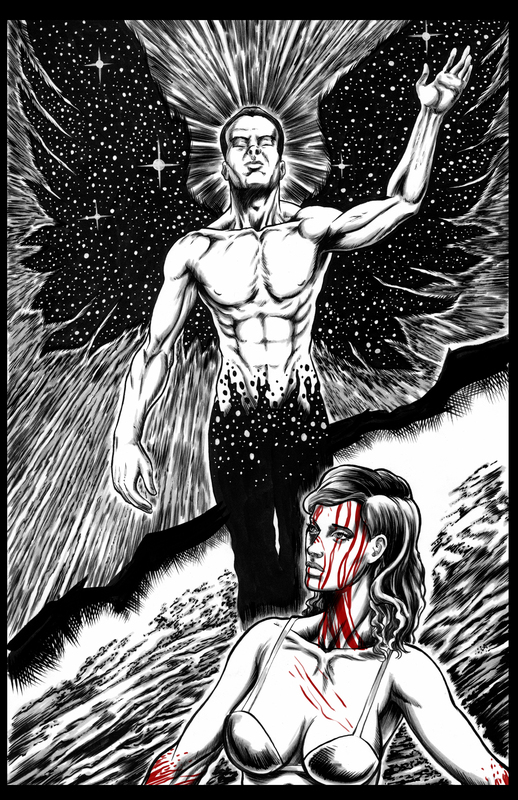 This is a search for redemption through horror-filled pages again brought to wicked life by Monty Borror. It’s a visually stunning piece that doesn’t pull any punches. It’s kick-arse. This is a story of gods and monsters, of self-discovery and a battle for identity for the heroine. It’s hard and it’s bloody and she unapologetically owns every bit of it. 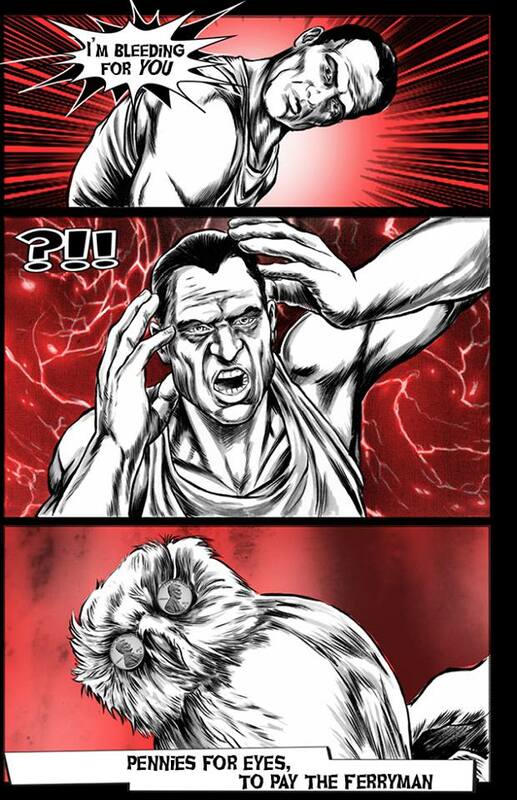 As you can see by the panels here, the art is superb, and Monty has captured the stories perfectly. The man also so very kindly sent over two original panels of artwork for me (the above is one), and they are just gorgeous! And look stunning on my wall. Anywho, if you’re looking for some rollickingly good horror, and some kick-arse art, the get onto The Road to Golgotha. Self-pimping aside, it’s a damn fine read. Recommended for anyone who loves horror, and the art of the comic/graphic novel. Note: this comic comes with a, ‘Explicit Content’ warning (which is cool in and of itself). So really not recommended for anyone under 18… or you’ll have some ‘splaining to do Lucy!